This post is in honor of my dear sister Kagnis Marie who’s currently dedicating 18 months of her life spreading the good word in Pennsylvania. Before she left, she had an obsession with Cafe Zupas. She would go there weekly, sometimes twice a week. If no one could go with her, she’d go on her lone diddly own…but really, I don’t blame her at all. Zupas seems to have done the impossible–provided healthy and delicious food for an affordable price. 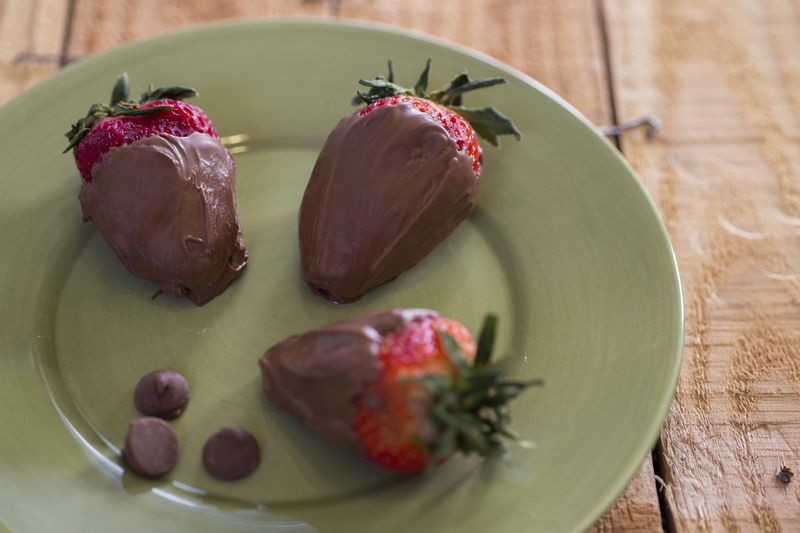 And let’s talk about that strawberry…delicately dipped in chocolate and included with your meal every time. And that’s not all. They even throw in a squishily soft and freshly-baked slice of bread with your salad. Thumbs up to Zupas. But here comes the sad part. I live in Logan. Meaning, the nearest Zupas is an hours drive away. Not ok. So, I decided it was time to get creative. 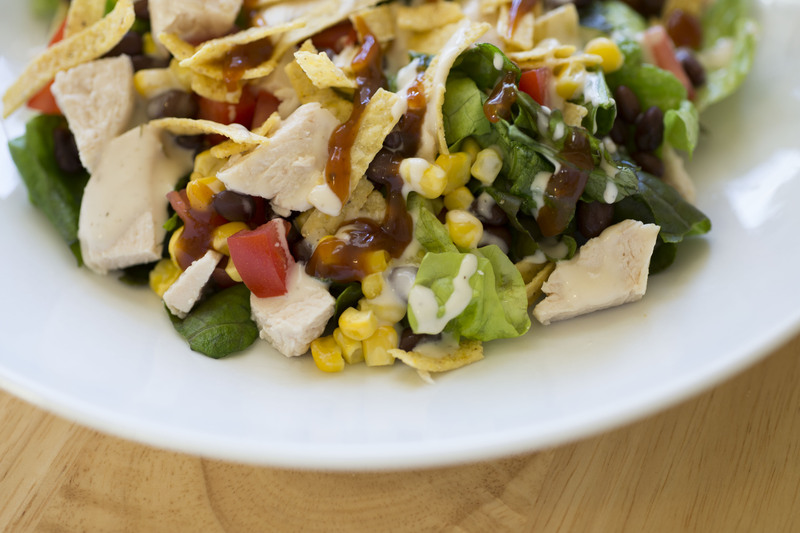 This BBQ chicken salad is a Cafe Zupas copycat, which turned out pretty dang delicious. At least my husband said so. Yes, you read that right. 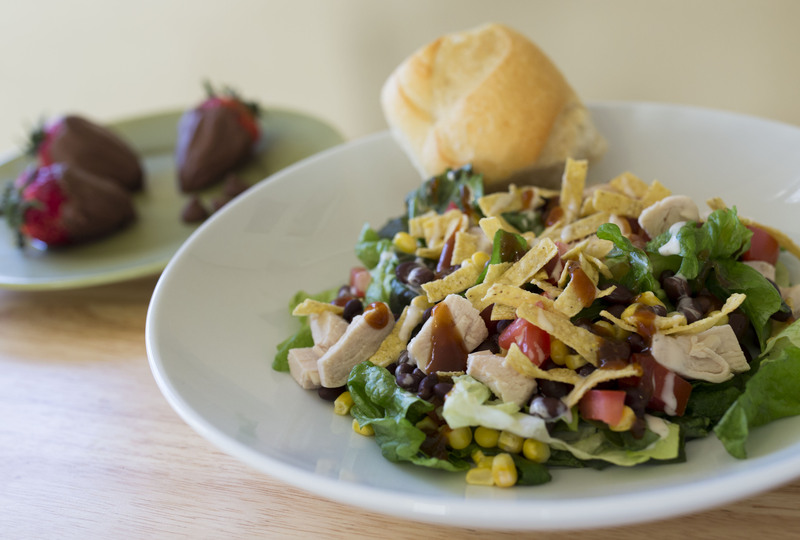 My husband–the candy, cookies, ice cream, Captain Crunch loving husband loved this salad. He actually asked me to make it again, the same week we had it the first time. Maybe it has something to do with the BBQ sauce and ranch that he dumped all over those leafy greens…but either way, a salad’s a salad. Bring a pot of water or chicken broth to a boil and add the chicken breasts. Cover with a lid and simmer for 20-25 minutes, or until cooked through. Remove from the water and allow to cool. Cut into bite-sized pieces. *note: If you’re in a hurry, you can use pre-cooked or frozen grilled chicken strips. Chop the lettuce into small pieces, rinse, and pat dry. In a large bowl, combine corn, beans, diced onions, tomatoes, and chicken. Toss with some ranch dressing and BBQ sauce. 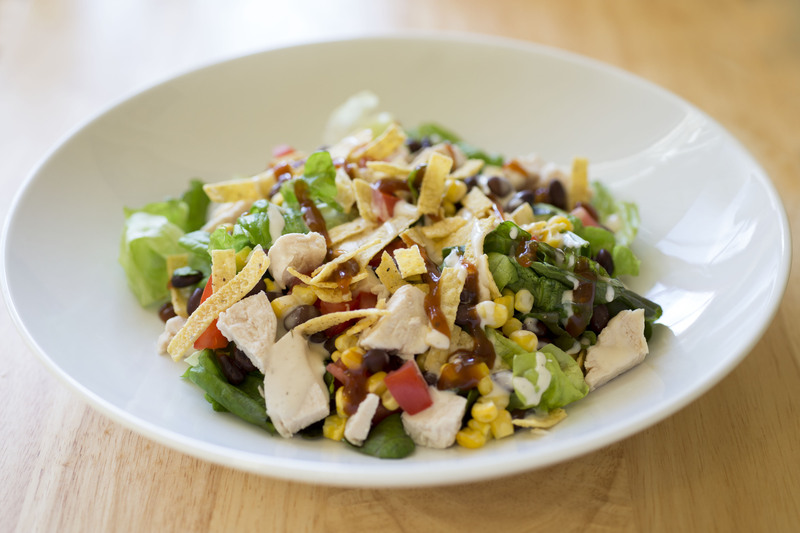 Sprinkle with tortilla-chip strips, and enjoy! 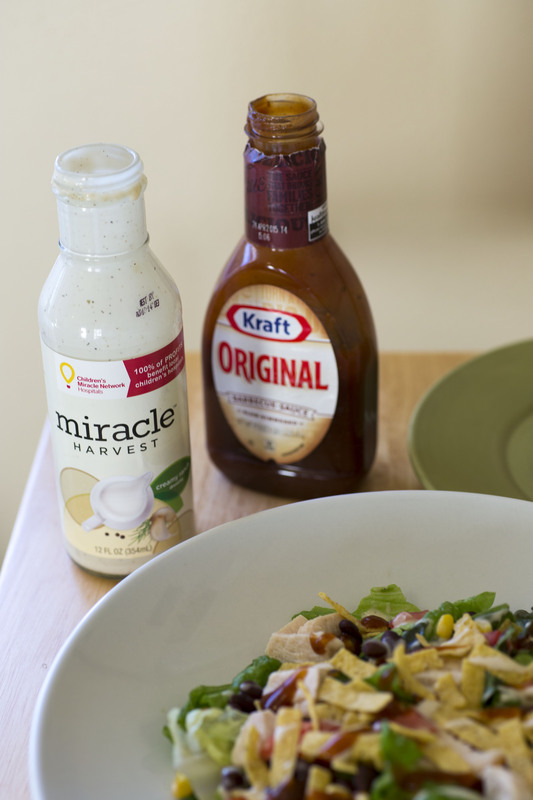 *note: for an even healthier version, opt for a lighter ranch dressing such as Miracle Harvest Creamy Ranch Dressing. 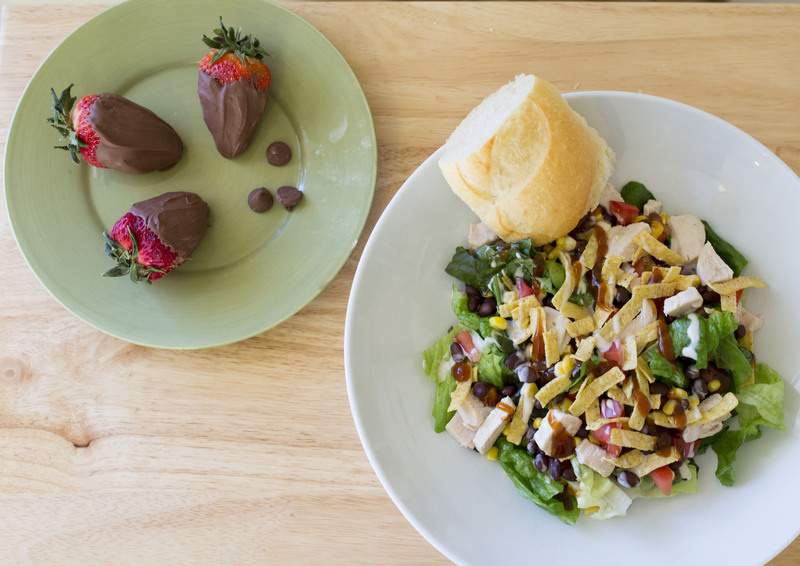 This salad wouldn’t be a true Zupas copycat if it didn’t include a chocolate-covered strawberry for dessert! 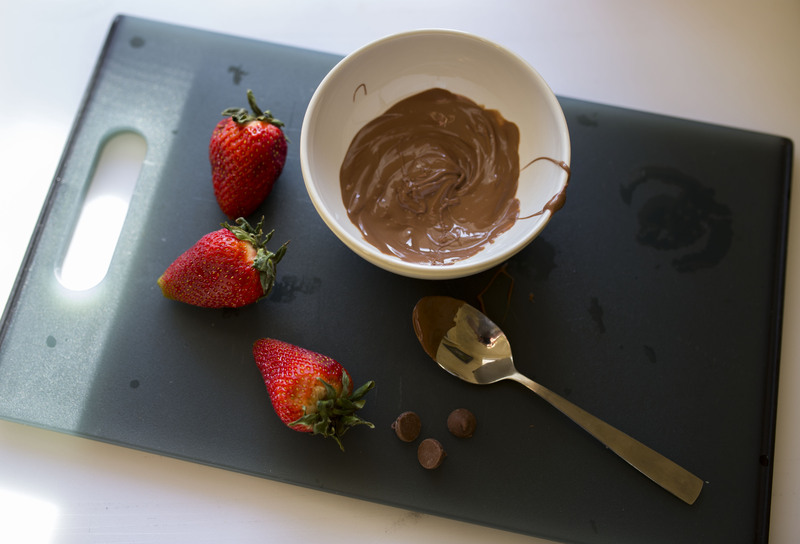 Melt the chocolate in the microwave for about 1 minute. Stir, and melt for another 30 seconds, or until the chocolate is liquid but not too hot. 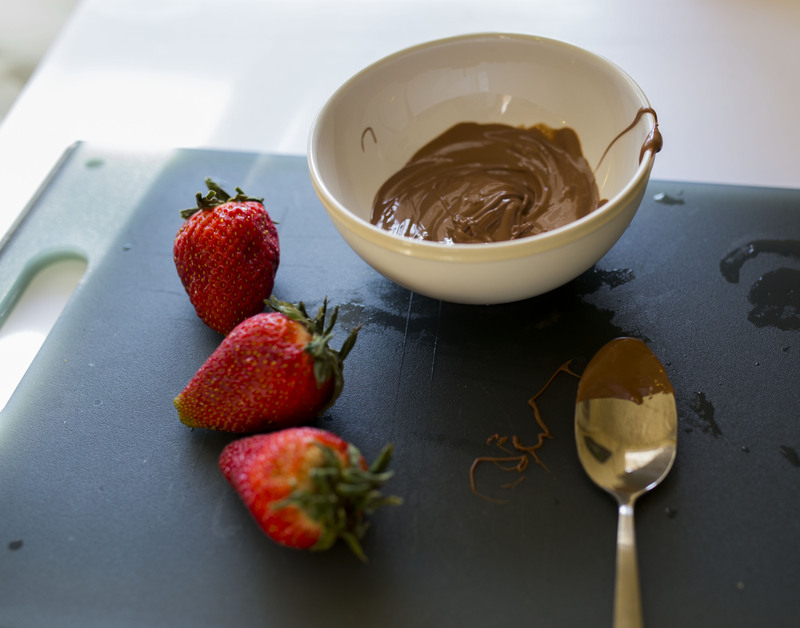 Dip the strawberries in the chocolate and place on a plate covered in parchment paper. Place in the fridge or freezer and allow the chocolate to harden before eating. A wonderful thing happened this week at the store. I was walking down the meat aisle and saw a GIANT hunk of meat staring at me from the pork-loin section. It had a bright yellow sticker on it that said: “Sale, half price! SAVE $17.00!” One minute later, that hunk of meat was taking a ride in my grocery cart to the check-out stand. So far, I’ve gotten three meals out of that thing, and I still have half of it in my freezer. Yay for big pork loins on sale! And one of the other great things about this salad is the fact that those lengthy instructions of how to marinate the pork with this, that, this, that, this and that, are non-existent! 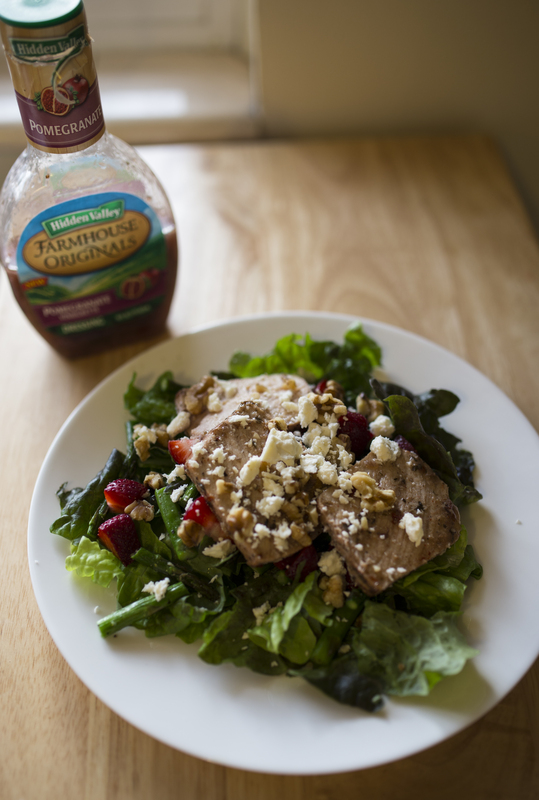 The marinade consists of ONE, yes, UNO ingredients: Hidden Valley Pomegranate Vinaigrette. Aaaah I love easy cooking. 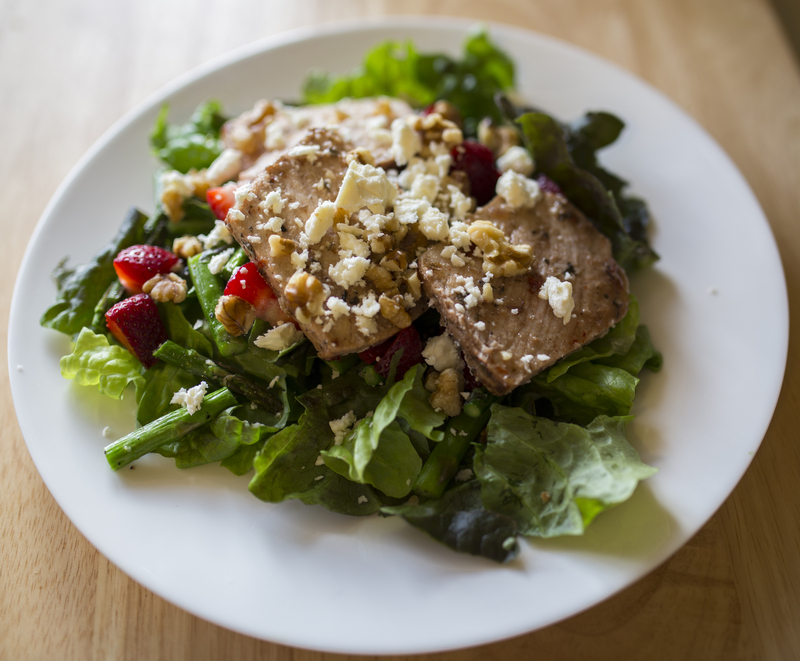 Rub pork generously with salt and pepper, and marinate in 1 cup of Pomegranate Vinaigrette Dressing overnight. Cover a roasting pan in tin foil and roast the pork for 25-35 minutes, until the internal temperature is 145 degrees. While the meat is roasting, wash and cut the lettuce into bite-sized pieces. 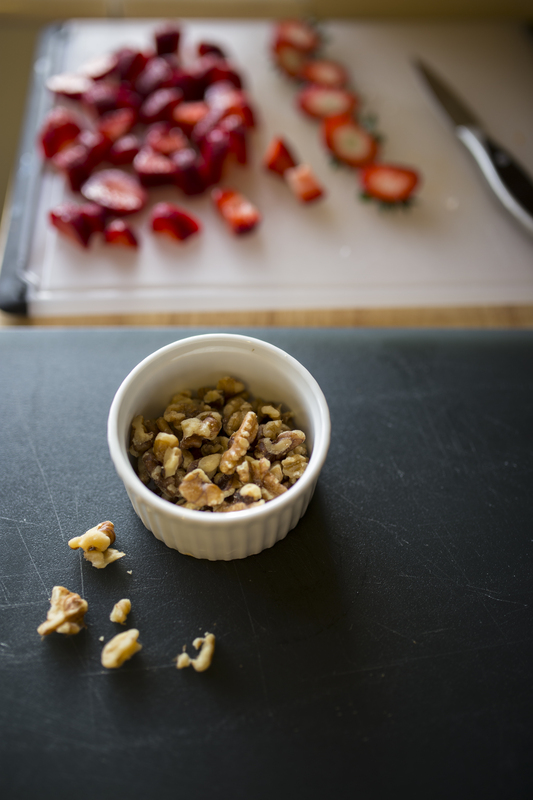 Crumble your feta and walnuts, and chop the strawberries into small pieces. 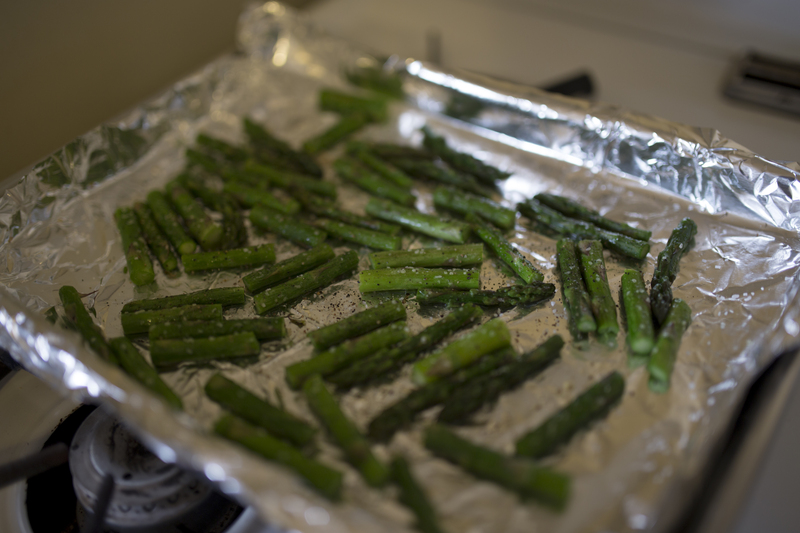 Chop asparagus into 1-inch pieces and toss in olive oil. Sprinkle with salt and pepper and spread on a baking sheet covered in tin foil. Once the meat reaches 145 degrees, remove from the oven and allow to rest for 10 minutes, then slice. 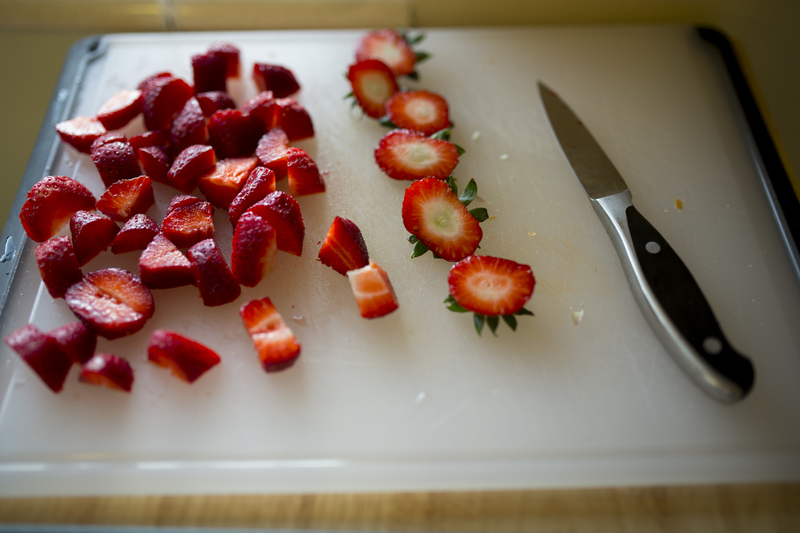 Combine lettuce, asparagus and strawberries. 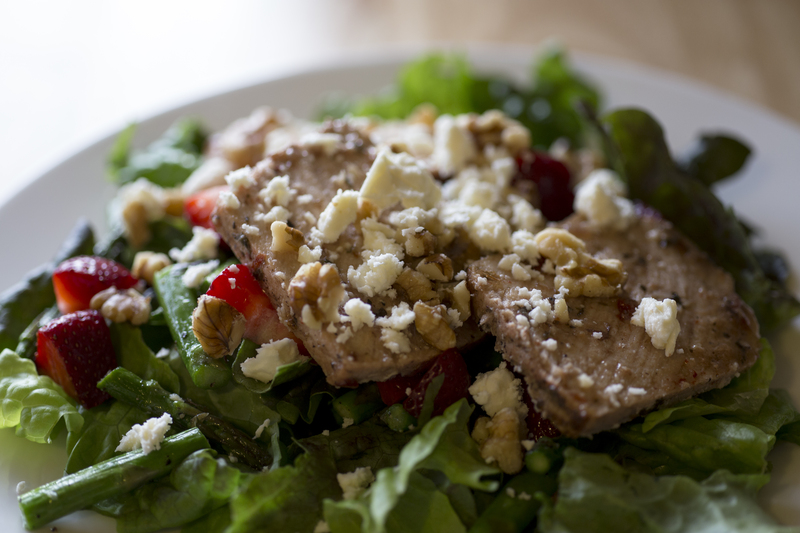 Sprinkle with feta cheese and walnuts, and place pork slices on top. Finish by drizzling extra dressing on top.